Next month’s OC Pathways Showcase will feature dozens of student-created STEM projects that demonstrate how educators and industry leaders are joining forces to educate and empower the next generation, using the concepts of human-centered design. And it will feature two special guests with out-of-this-world career trajectories. 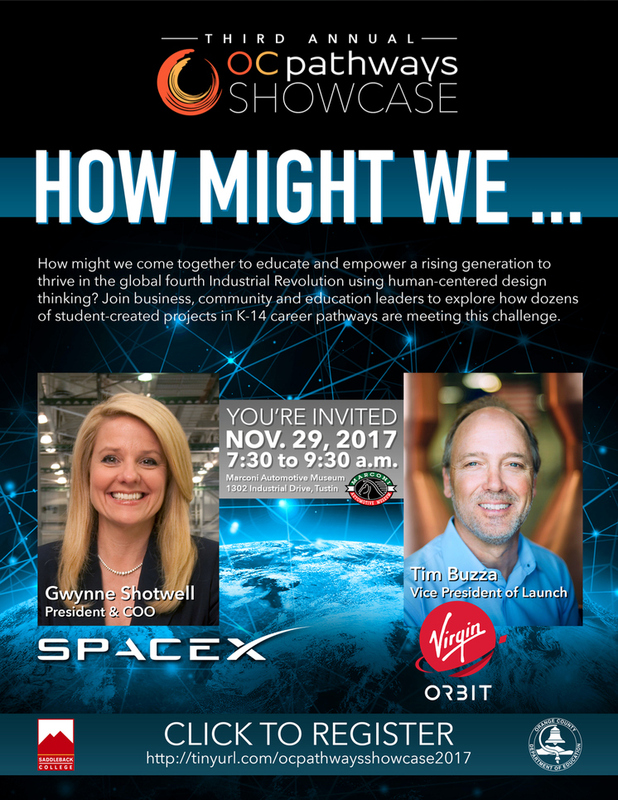 Gwynne Shotwell, president and chief operating officer of SpaceX, and Tim Buzza, vice president of launch for Virgin Orbit, have been tapped as featured speakers at the Nov. 29 event, which will be held from 7:30 to 9:30 a.m. at the Marconi Automotive Museum in Tustin. This year’s showcase — the third annual — is expected to draw more than 400 attendees from schools, colleges, businesses and community organizations, and there’s still time to participate by registering at http://tinyurl.com/ocpathwaysshowcase2017. Led by OCDE and Saddleback College, OC Pathways is an initiative that teams educators with business leaders to establish career paths and work-based learning opportunities for students. Partners develop coursework that combines rigorous academics with career preparation in STEM-related industry sectors, including engineering/advanced manufacturing, healthcare/biotechnology, and information and communications technology/digital media. The OC Pathways partnership, created in 2014 through a grant from the state Department of Education, now includes 14 school districts, nine community colleges, multiple universities, numerous regional agencies and scores of industry and community partners, which gather each year to showcase student projects and career paths. “The OC Pathways Showcase highlights the extraordinary collaboration taking place in Orange County, bringing together K-12, community colleges, universities, community partners and employers to pursue a shared vision of preparing the students of today to be the social, intellectual, economic and civic leaders of tomorrow,” Hittenberger said. For details, or to register for the event, visit http://tinyurl.com/ocpathwaysshowcase2017. And for more on OC Pathways, take a look at this brief video.